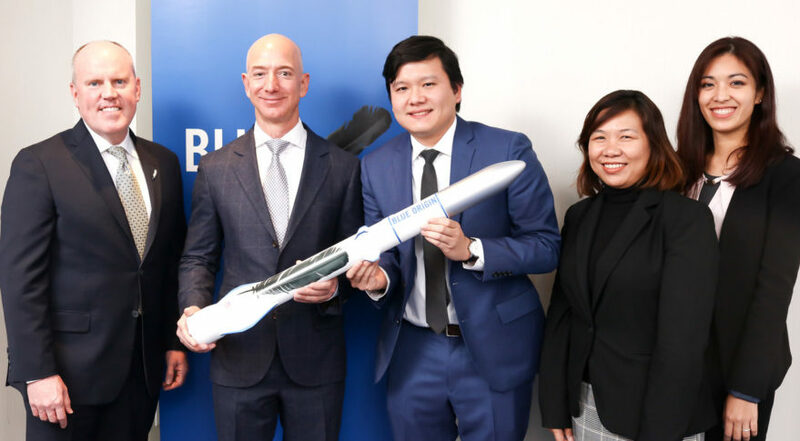 From left to right: Bob Smith, Blue origin CEO; Jeff Bezos, Blue Origin founder; James Yenbamroong, mu Space founder and CEO; Puntipa Pholperm, mu Space chief legal officer; Nattha Srisomwong, mu Space associate director of corporate development and legal. Credit: Blue Origin. SINGAPORE — Thai satellite startup mu Space is seeking bids for a geostationary satellite with high-throughput capacity covering the Asia Pacific. The request for proposal, released June 25, is for the construction of satellite mu Space says it will launch in 2021 on Blue Origin’s New Glenn rocket. Mu Space Chief Technology Officer Samathorn Teankingkaeo told SpaceNews the company is budgeting $100 million to $150 million for a satellite it hopes will have enough cutting-edge features to make it competitive against other high-throughput systems in the region. Through a contract with SES, mu Space has access to C- and Ku-band spectrum at the 50.5 degrees east orbital slot for 15 years, with the option to extend for another 15-year period, Teankingkaeo said. He declined to say how much Mu Space paid for the slot and its associated frequencies. Teankingkaeo said mu Space intends to carry C- and Ku-band payloads on the satellite, as well as Ka-band if it can get access to the spectrum. “We are talking with SES to get Ka-band as well,” he said. Depending on the amount of spectrum available, mu Space envisions the satellite supplying at least 50 gigabits per second, and as much as 100 Gbps, of total throughout. Teankingkaeo said mu Space wants the satellite to have a digital processor and an onboard phased-array antenna so that it can relocate capacity over areas of interest instead of having a static footprint for its intended 15-year lifetime. “We want to have flexibility so that if there is no demand in an area we can move the beam to where there is demand and try to use our capacity up to 100 percent as soon as possible,” he said. Teankingkaeo said mu Space is willing to consider a condo-sat arrangement where it shares the same spacecraft platform with another operator, but would prefer its own dedicated satellite. The company anticipates awarding a contract by the end of the year. Mu Space’s use of an orbital slot held by Luxembourg-based SES means Thailand’s regulators will treat the satellite as foreign despite mu Space being a Thai company, Teankingkaeo said. Thailand’s regulations, which protect domestic operator Thaicom, would prevent mu Space from providing telecom services in Thailand. Teankingkaeo said Thailand’s Ministry of Digital Economy and Society is drafting new regulations that would open the Thai market — exposing Thaicom to new competition but benefiting Mu Space and companies desiring to do business in Thailand. “We expect everything to be clear by third quarter or end of the year,” Teankingkaeo said. 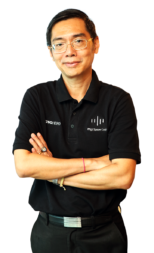 Thaicom Chief Commercial Officer Nile Suwansiri said his company welcomes competition. Even if mu Space doesn’t gain access to the Thai market, Teankingkaeo said, the company’s business plan still closes. Mu Space is focused on the larger Indochina region, he said, including countries like Myanmar, and from 50.5 degrees could extend its coverage all the way out to Africa. As a startup, mu Space is raising money to finance its proposed satellite. Teankingkaeo declined to say how much the company needs to raise — or how much it has raised to date —but said mu Space anticipates securing funding later this year.